← Brining Meats for Long Term Storage. Lately I have been looking at many jerky recipes, most of the new ones use complicated flavored marinates and some form of cooking or refrigeration. Many of the recipes tell you to dunk the meat in boiling marinate or to heat it at a specific temperature. Now these are the safest methods under normal conditions. But what about making jerky under emergency conditions? First Jerky is dried not cooked meat. In its simplest form, it is any lean meat that has been salted and dried. I have made it without salt but it does not store as well for long term, but will still last for many months. The drying process not only preserves the meat by removing much of the water content; it also reduces the weight. A pound of fresh meat ends up as about 4 ounces of jerky. To make jerky, take any lean meat and cut it into 1/8- to 1/4-inch-wide strips. Cut against the grain and your jerky will be tenderer. Trim off all the fat you can from the meat, since the fat will turn rancid. If you have salt, the next step is to soak the strips in salt water or rub the meat with salt. After they are salted, you will hang them over a drying rack. 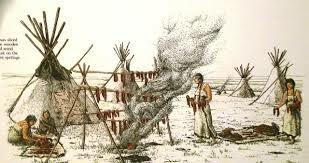 Lewis and Clark used peeled willow sticks to skewer meat and fish strips, then hung them in bushes to dry. Build a drying rack out of whatever materials are at hand. Start a small fire underneath the rack. Keep the fire small, you don’t want it to cook the meat, you want the smoke to keep the insects away. Dry the meat until it is brittle. It is always safer to over dry than to under dry, because if it’s not dry enough, it can mold. After the meat is dried, be sure and keep it dry, if it gets wet, it will mold. This entry was posted in food storage, preserving foods and tagged dried meat, Howard, jerky. Bookmark the permalink. I have used an “over-dried” South African recipe using vinegar, cayenne and corriander for seasoning, drying past the usual biltong ztaw to approach jerky consistancy, and it has worked well. OK to substitute black pepper for the cayenne, if you prefer.